Seeding after a fire can be a daunting task. This page is written for victims of damage by wildfire. Our hope is that we can offer help in your efforts to recover your land and belongings after the fire. 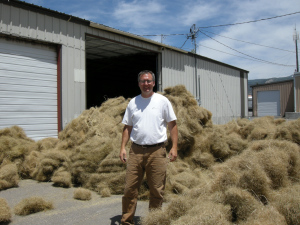 Great Basin Seeds can offer you the highest quality ready made seed mixes to protect your property from the unavoidable erosions and aftermath of fires. The guidelines below are applicable to many fire situations in the western United States. The NRCS website has a webpage with offices broken down by state. We encourage you to reach out to them for boots-on-the-ground assistance. Once they help you formulate a plan and give seed recommendations give us a call. We can help you with the seed. After a major wildfire erosion control will be a priority. Planting at the right time is crucial to plant establishment and soil stabilization. “Wildlands” or “range” seedings are usually most effective when sown in the fall or winter. Consider the natural life cycle of a plant: it blossoms in the spring or early summer, produces fruit (and seed) late summer and drops seed in the fall. The seeds either germinate and “crown out” then go dormant, or they lie dormant until spring when it germinates and grows into a new plant. The process repeats itself. Fall plantings most closely replicate that cycle. Fall plantings usually start in late september and run through october, but successful plantings can be sown as late as November and December. While fall plantings are generally preferred, spring plantings work well also – don’t be discouraged or feel you can’t plant just because fall has passed. Try to get the seed on the ground as soon as possible so that it takes advantage of early spring moisture. Spring plantings are a good choice. Most seeds can be planted any time of year assuming sufficient water is available to cary the plant through the germination cycle and early stages of growth. How can I prevent erosion and prevent future fires? In many cases, fires burned out long ago but the land recovery efforts continue. The information below are post-fire efforts that are ongoing in different parts of the country. Below are tables of recommended grasses, forbs (flowers) and shrubs that were previously recommended for wildfires in Washington State. For the purposes of this fire help page, “irrigated” is any species that requires 16″ or more annual precipitation. If your area does not have at least 16″ then you should plan to irrigate or plant dryland or drought tolerant species. Many of Great Basin Seeds plant species are hand picked for their drought tolerance. Needle and Thread Grass Dryland Excellent erosion control but pesky needles!